Are you dreading hearing the words, “I’m bored” over break? Here’s a fast-paced dice game you can play with your child. The rules are flexible and the math content can be adjusted based on the age of your child. Find three different colored dice. I happened to have green, white and red. If you don’t have colored dice, you could also number the dice or use one normal die and roll it three separate times. Roll the white die and subtract the white die from the red die. Sometimes this produces a positive number and sometimes this produces a negative number. If the green die is even, your score for that round (the red die minus the white die) doubles. This is wonderful if you had a positive number but it’s a huge disappointment if you had a negative number. If the green die is odd, your score for that round (the red die minus the white die) clears to zero. This is wonderful if you had a negative number but it’s a huge disappointment if you had a positive number. Keep a running list of the scores for each round and add them together at the end to see who wins. You can choose whether the highest score or lowest score wins. Once you’ve played the game, I encourage you to be creative. Work with your child to come up with a new math game involving dice, a board game, a puzzle, or any counting manipulatives you can find around the house. Together you will remove the potential boredom from break! If you have any questions, please feel free to contact me on Twitter (@TableTalkMath) or comment below. Welcome to Table Talk Math. This week, we're highlighting the work of Dr. Jo Boaler. This week's newsletter is intended to be a conduit between the people registered to receive and the work of Dr. Jo Boaler, a professor at Stanford University. In particular, we are hoping that you will get to know youcubed.org quite well. Dr. Boaler and her team created this site as a central hub for research-based mathematics conversations and justifications. If you are looking for documentation to back up why we shouldn't be giving timed tests, why finger counting is still a good thing, and a few other ideas, this site is for you. To be honest, this is one of my favorite times of the year, even since I was a kid. For many families, especially around the United States, Thanksgiving is a time of year that jogs so many memories: the smell of turkey, the sound of laughter and time spent with family, and the rustling of the newspaper as everyone looks through the ads for the best Black Friday deals. With that in mind, this week's newsletter is a suggestion to get your child(ren) involved in the process and bring math into the conversation as well. 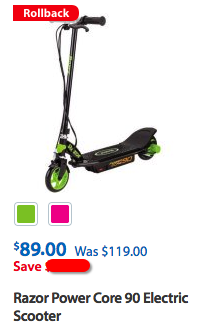 For example, in the image above, how much could I save on the scooter by purchasing it on Black Friday? Below are a few different ways to manipulate the numbers so that different types of chatter comes up when flipping through the pages. 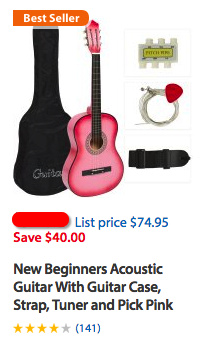 What is the sale price of the guitar? 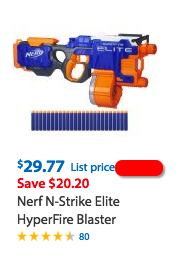 What was the list price of the nerf gun? 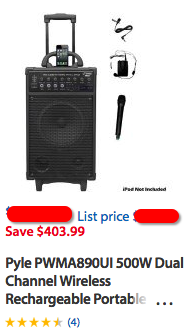 What would be a good sale price for this product? What would a fair list price for this product? How much markup would you have to have on this product to make a profit? What is the demand for this product on the open market? Clearly, there are quite a few different questions that can arise from shading out various elements of the prices on advertising. Tell your child that you also have a 15% coupon and it can be used on your entire purchase, a single item, or only on non-electronic items. Playing around with this idea gives way to a variety of responses for a variety of age ranges. For a list of advertisements around the major companies, head over to this site. If you have any questions, please feel free to contact us on Twitter (@TableTalkMath) or reply to this email. It is my sincere hope that you have the best of times at Thanksgiving this year, no matter who you are with or what you are doing.